On my last trip to the Niobrara Valley Preserve, I photographed the bark of wildfire-killed pine trees in warm late day light. I liked both the patterns and the color and was just trying to make some visually-interesting images. As I was taking the photos, I saw numerous small holes in the trees but didn’t think much about them. Holes in dead trees are not really unusual, after all. Upon looking at the photos later, however, I noticed something intriguing – many of the holes seemed to have a funnel shape, or beveled edge, at the surface of the tree. 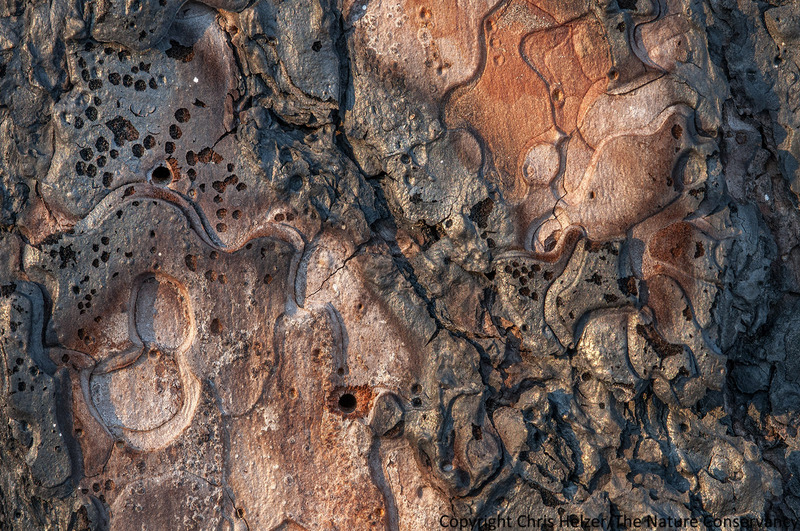 Tiny holes in the bark of a standing dead ponderosa pine tree killed by a 2012 wildfire. The two near the center of the image have a funnel-shaped or beveled edge to them. The Nature Conservancy’s Niobrara Valley Preserve, Nebraska. I couldn’t come up with a good explanation for that beveling, so I did what I usually do when I can’t identify something – I sent the photos to people with more expertise and begged for help. Ted MacRae was kind enough to respond that except for the flared ends, the perfectly round holes might have been created by adult pine sawyers (Monochamus spp.). James Trager liked my speculation that perhaps something like a woodpecker might have chipped away at the holes, looking for an invertebrate meal, and added nuthatches and chickadees as other options. But none of us have a good answer. After hearing back from Ted and James, I looked more closely at other photos from that evening and noticed something else that might or might not be a useful clue. Not only had the edges of some of the holes been chipped (?) away, but there were similar marks elsewhere on the bark. I’m not sure if those are related to what happened around the margins of the holes or not. In the photo below, look at the “pitting” – especially in the top left quarter of the image. More holes in trees, along with tiny chipped or pitted marks, both around the insect(?) holes and elsewhere. Is some creature (bird? insect? microbe?) chipping away at the tree? If so, why? And is that creature chipping away at the edges of holes made by beetles too? And if so, WHY? 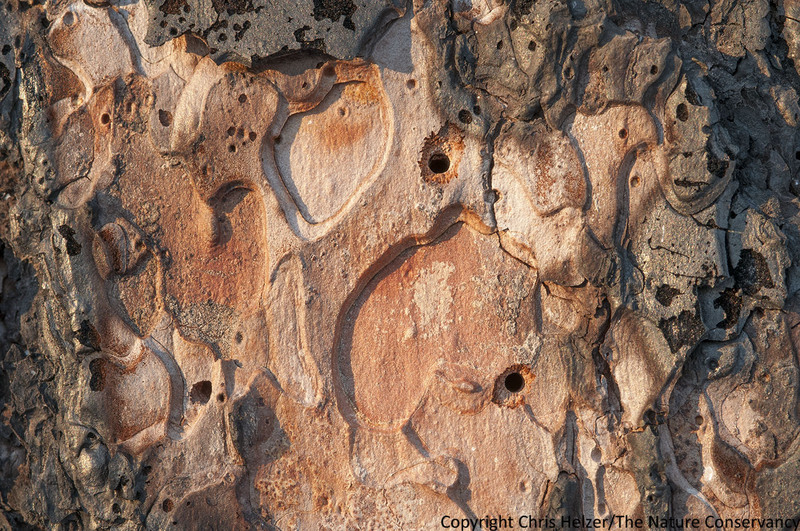 Or, are the beveled edges of the round holes a separate phenomenon from the pitted surface of the bark elsewhere? I guess it’s good for my brain’s health to ponder mysteries like this, and it’s fun to think through all the possibilities. On the other hand, it would also be fun to KNOW WHAT THE HECK IS HAPPENING HERE, so if you have good theories – or even better, actual answers – please let me know! I didn’t measure the holes, so I hesitate to give estimates of their size, but they were really small. Maybe 3-4 mm across? I didn’t give that info to Ted (but I should have), and I’m wondering now whether the holes were actually too small for pine sawyer beetles.